MISSION, KS--(Marketwired - Dec 1, 2014) - (Family Features) If you're looking for a fashion-forward way to get festive this holiday season, look no further than your own closet, where you can find outdated pieces to transform and add sparkle to your holiday wardrobe. Closet staples like scarves, belts, boots and even tops can easily evolve from a boring basic into something sparkly for a holiday party. Using items you already own (or hitting the sale racks or consignment stores) will let you put your best fashion foot forward and flaunt your own personal style without breaking the bank. You can create an eye-catching top using an old non-descript T-shirt in less time than it takes to drive to the mall. From interior design to textiles, chevron is a very "now" look, and you can easily create it at home using a style adapted from the DIY fashion blog www.wobisobi.com. Start with a solid colored T-shirt and tape off a zig-zag pattern using painters tape (choose one width or mix up your stripes by using various widths of tape). Use a ruler to measure out evenly spaced peaks and valleys, making sure you keep an even distance between the lines. Then just use a sponge (or paint brush) to apply fabric paint, such as America's Favorite Fabric Paint, Tulip Soft Fabric Paint, which dries soft and flexible so it moves with your fabric items and won't crack or crumble. It's available in a variety of shades with seven different finishes, including glitter and metallic to get that holiday sparkle. Carefully peel away the tape and let the paint dry thoroughly. Add your favorite pants and a smart jacket, and you've got a fresh style that is yours and yours alone. Presents aren't the only thing you can wrap to make pretty this holiday season. Make an old belt new and wrap it around your waist to instantly update an old dress or sweater, as in this project from www.dreamalittlebigger.com, a blog dedicated to DIY projects for home and style. Then just shake on Tulip Fashion Glitter, a professional-grade fashion glitter with a permanent shine that lasts wash after wash. You can find a variety of colors, cuts and finishes to create a custom look that is uniquely yours. 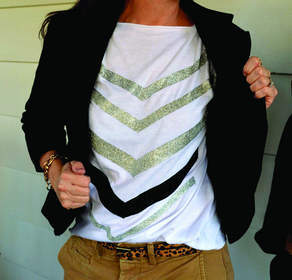 For more DIY fashion ideas to make your holiday wardrobe sparkle, visit http://www.pinterest.com/ilovetocreate/tulip-sparkle-diys/.